Such DNA nanorobots may themselves sound like science fiction, but they already exist. In 2012 Wyss Institute researchers reported in Science that they had built a nanorobot that uses logic to detect a target cell, then reveals an antibody that activates a “suicide switch” in leukemia or lymphoma cells. It’s a familiar trope in science fiction: In enemy territory, activate your cloaking device. And real-world viruses use similar tactics to make themselves invisible to the immune system. Now scientists at Harvard’s Wyss Institute for Biologically Inspired Engineering have mimicked these viral tactics to build the first DNA nanodevices that survive the body’s immune defenses. “We’re mimicking virus functionality to eventually build therapeutics that specifically target cells,” said Wyss Institute Core Faculty member William Shih, Ph.D., the paper’s senior author. Shih is also an Associate Professor of Biological Chemistry and Molecular Pharmacology at Harvard Medical School and Associate Professor of Cancer Biology at the Dana-Farber Cancer Institute. The same cloaking strategy could also be used to make artificial microscopic containers called protocells that could act as biosensors to detect pathogens in food or toxic chemicals in drinking water. DNA is well known for carrying genetic information, but Shih and other bioengineers are using it instead as a building material. To do this, they use DNA origami — a method Shih helped extend from 2D to 3D. In this method, scientists take a long strand of DNA and program it to fold into specific shapes, much as a single sheet of paper is folded to create various shapes in the traditional Japanese art. Shih’s team assembles these shapes to build DNA nanoscale devices that might one day be as complex as the molecular machinery found in cells. For example, they are developing methods to build DNA into tiny robots that sense their environment, calculate how to respond, then carry out a useful task, such as performing a chemical reaction or generating mechanical force or movement. Such DNA nanorobots may themselves sound like science fiction, but they already exist. 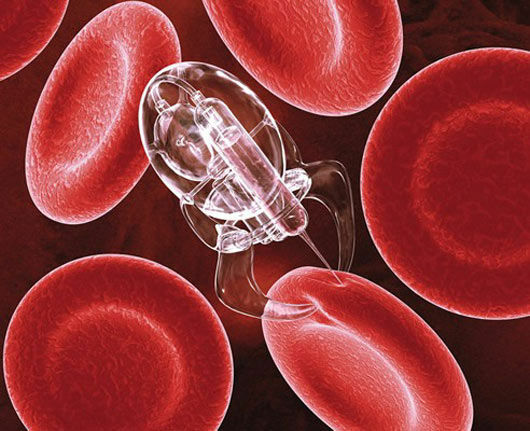 In 2012 Wyss Institute researchers reported in Science that they had built a nanorobot that uses logic to detect a target cell, then reveals an antibody that activates a “suicide switch” in leukemia or lymphoma cells.For a DNA nanodevice to successfully diagnose or treat disease, it must survive the body’s defenses long enough to do its job. But Shih’s team discovered that DNA nanodevices injected into the bloodstream of mice are quickly digested. “That led us to ask, ‘How could we protect our particles from getting chewed up? '” Shih said.Nature inspired the solution. The scientists designed their nanodevices to mimic a type of virus that protects its genome by enclosing it in a solid protein case, then layering on an oily coating identical to that in membranes that surround living cells. That coating, or envelope, contains a double layer (bilayer) of phospholipid that helps the viruses evade the immune system and delivers them to the cell interior. “We suspected that a virus-like envelope around our particles could solve our problem,” Shih said. To coat DNA nanodevices with phospholipid, Steve Perrault, Ph.D., a Wyss Institute Technology Development fellow in Shih’s group and the paper’s lead author, first folded DNA into a virus-sized octahedron. Then, he took advantage of the precision-design capabilities of DNA nanotechnology, building in handles to hang lipids, which in turn directed the assembly of a single bilayer membrane surrounding the octahedron. Perrault then demonstrated that the new nanodevices survived in the body. He did that by loading them with fluorescent dye, injecting them into mice, and using whole-body imaging to see what parts of the mouse glowed. Just the bladder glowed in mice that received uncoated nanodevices, which meant that the animals broke them down quickly and were ready to excrete their contents. But the animals’ entire body glowed for hours when they received the new, coated nanodevices. This showed that nanodevices remained in the bloodstream as long as effective drugs do. The coated devices also evade the immune system. Levels of two immune-activating molecules were at least 100-fold lower in mice treated with coated nanodevices as opposed to uncoated nanodevices. “Patients with cancer and other diseases would benefit enormously from precise, molecular-scale tools to simultaneously diagnose and treat diseased tissues, and making DNA nanoparticles last in the body is a huge step in that direction,” said Wyss Institute Founding Director Don Ingber, M.D., Ph.D. This work was funded by the National Institutes of Health, the U.S. Army Research Laboratory’s Army Research Office, and the Wyss Institute at Harvard University.